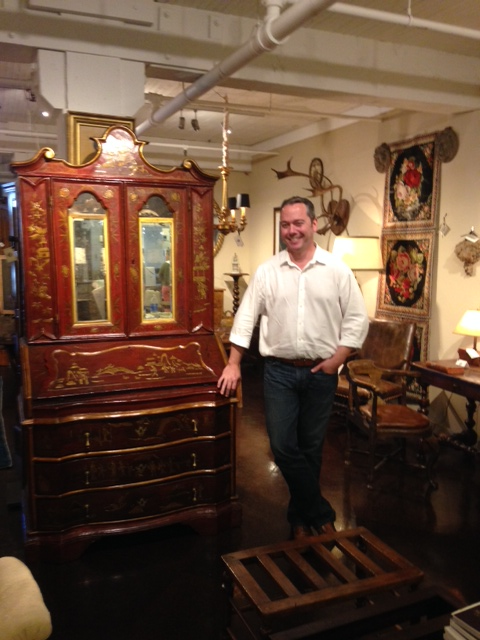 Since 2008 the shop he manages, Garden Court Antiques, has been on the first floor of the building at 2 Henry Adams. From 2002 to 2006 the business was also a Bay West tenant at 5 Henry Adams. Gallagher’s been there all along. On Monday he was shocked to learn that the company that manages the building, Bay West, is going to move Garden Court Antiques from its prime location to the back of the 4th floor of the Galleria Building across the street. Bay West manages both properties for the giant Chicago-based real estate investment firm, RREEF. He’s been given 30 days notice. Garden Court’s lease, the latest of several that the business has signed with Bay West, doesn’t expire until 2016. But Gallagher and Garden Court owner Sue Coleman didn’t notice a new clause in the current lease saying that Bay West could move the shop to a different space of similar size within the two buildings and would cover the cost of the move. If, however, Garden Court was unhappy with the proposed new space, it could break the lease at that time. Just so, Gallagher said that on Monday Bay West told him that if he didn’t want to move to the back of the Galleria’s fourth floor, he could break his lease and leave. On October 9 the Chronicle reported that Pinterest is expanding into 100,000 square feet at 651 Brannan. Four days later, Gallagher got his 30-day notice. Calls to Bay West’s Tim Treadway and Martha Thompson were not returned. I asked former Mayor Art Agnos, who advocated the tenants’ cause last summer before the Board of Supervisors’ Land Use Committee, to comment. This entry was posted in updates on November 2, 2014 by zelda.